You jIvas have only little fragments of that Power. So if you cannot eradicate the world, the mind and the MAyA that I have made, you dont have to cry over it. It is not in your Power. It has to take place only by My Grace. Come nearer to Me through Devotion ! I shall do the eradication in proper doses for you. That somebody is able to control his mind and is able to walk on the path of jnAna - that again is My own Grace. It is I who have granted that privilege to him. What appears as many and different must be seen as one. To crave for that view is what is called advaita-vAsanA. One gets it only by My Grace. 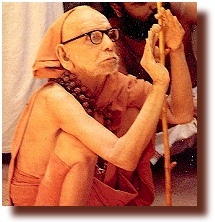 (Now the Mahaswamigal, who has been talking in the words of the Mother Goddess, continues on his own). There is another novelty here. Even the jnAni who has had the non-dual Enlightenment, still enjoys the play of mAyA. He sees the different things; but knows they are all one. Just as a spectator of a play who is not playing any role in it, the jnAni enjoys the playful novelties of mAyA and revels in his devotion to that parA-Sakthi who is the author of it all. To be keeping such jnAnis in this dual-non-dual state is also the work of Mother Goddess.